Downtown Indy, Inc. (formerly Indianapolis Downtown, Inc.) came to INNOVATIVE with a major challenge. Their entire business database was running off of an archaic program more than a decade old. The database was no longer functioning how they needed it. In addition to the database, their website was also outdated. INNOVATIVE partnered with Downtown Indy, Inc. to create a custom database to solve this problem. The custom database, plus additional custom content management elements feeds, fuels their business and their new website. Building the new custom database, Victory, took a lot of time and strategy. INNOVATIVE met with key stakeholders several times a week to identify all of the needs and wants of the new database and website. We had to reverse engineer the old data, audit, update it to modern structures and then create a usable interface for the Downtown Indy, Inc. staff. Victory was the first priority, but a new, public website was equally important for the success of the project. The new website had to be responsive, highlight the benefits of living downtown, deliver a comprehensive event calendar plus more. The website has many functions and many audiences, so it was imperative we create a navigation structure that made your intended destination clear regardless of your goal – live, work, play, get around, etc. Traffic and engagement on the site has more than doubled since launching. INNOVATIVE continues to enhance and manage the Downtown Indy, Inc. website and database through our maintenance contract. Websites are living, breathing organisms that require constant attention to stay up-to-date and relevant. Downtown Indy, Inc. understood this from the beginning, which allows their site to evolve as we gain more user data. 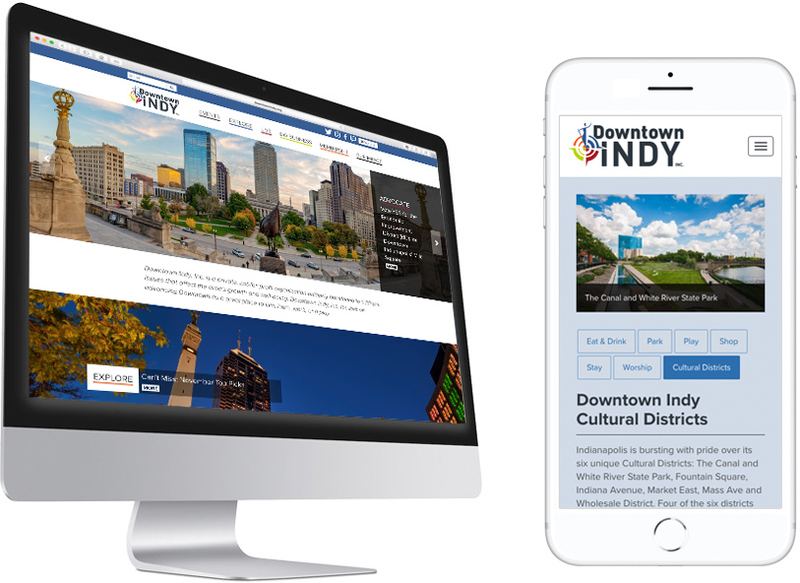 Additionally, during the database and website project, our analysis revealed the need for Downtown Indy, Inc. to rebrand and make their product – the downtown – the focus of the brand. INNOVATIVE worked with them on a new name and full brand identity package. This project ran in parallel to the database and website projects to ensure a single, cohesive launch to create the largest splash and earned media opportunity.